Midajah McCarty’s steal and three-point play with 14.6 seconds to go gave the Lions the lead and they held on for the 47-43 victory at SLAM Academy. Calvary Chapel trailed by as many as 12 points in the fourth quarter on Friday against Needles in the 2A Southern League semifinals. But something told senior guard Midajah McCarty that the team’s season wasn’t quite over. McCarty’s steal and three-point play with 14.6 seconds to go gave the Lions the lead and they held on for a 47-43 victory at SLAM Academy. The Lions (15-11) play Lincoln County (15-10) in the championship game at 11 a.m. Saturday at Del Sol. Both teams advance to next week’s state tournament. Calvary Chapel trailed 41-29 with 5:03 to play, but the Lions turned up the defensive pressure, and Needles didn’t have an answer. The Mustangs (27-6) turned the ball over nine times in the fourth quarter, most coming against Calvary Chapel’s full-court press. 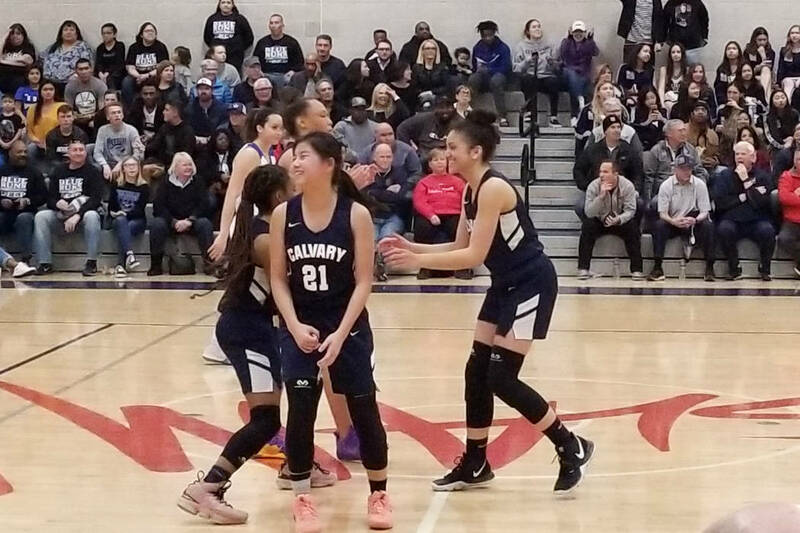 Freshman Olivia Bell scored eight of her 22 points in the fourth quarter for Calvary Chapel, which didn’t look like it was going to have a postseason opportunity after it was forced to forfeit 11 league wins for using an ineligible player. 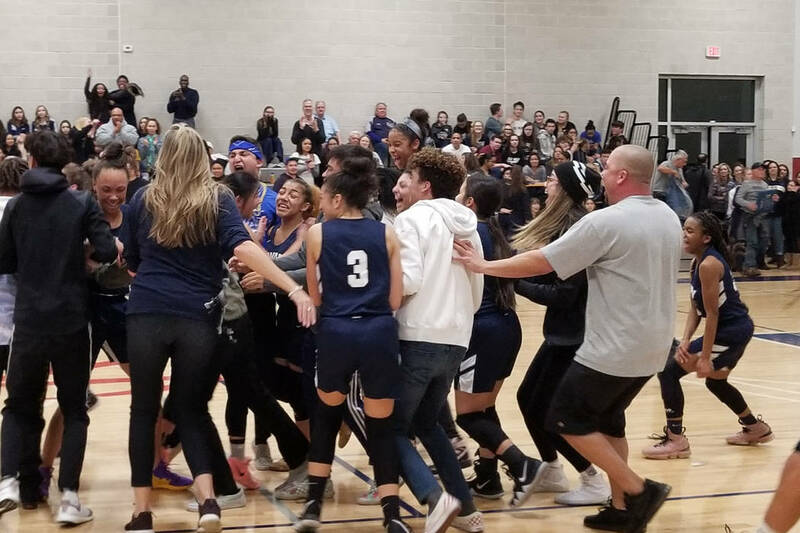 But the Lions appealed and a hearing officer ruled that Calvary Chapel would have won six of those games without the ineligible player and restored those victories. That was enough to get the Lions into the playoffs and now the state tournament. “It was really hard for us at that moment,” McCarty said of the forfeits. Tyra Perkins added 14 points and 11 rebounds for Calvary Chapel. Marie Mills led Needles with 14 points, and Paige Murch added 11 points, 14 rebounds and three blocked shots for the Mustangs. Lincoln County 38, Lake Mead 26 — The Lynx used a 12-0 run in the third quarter to pull away and defeat the Eagles. Lake Mead hit two 3-pointers early in the second half to cut the lead to 19-17, but Lincoln County’s Alexis Long scored the next four points to spark the 12-0 run. Kendra Mathews had 11 points, 13 rebounds and three blocked shots for Lincoln County, which held Lake Mead without a field goal in the second quarter. Long added eight points and five rebounds, and Sadie Soderborg had seven points, five rebounds, four blocked shots and three steals. Lauryn Freund led Lake Mead (12-8) with nine points, and teammate Rebekah Fuller had six points, 14 rebounds and six blocked shots.